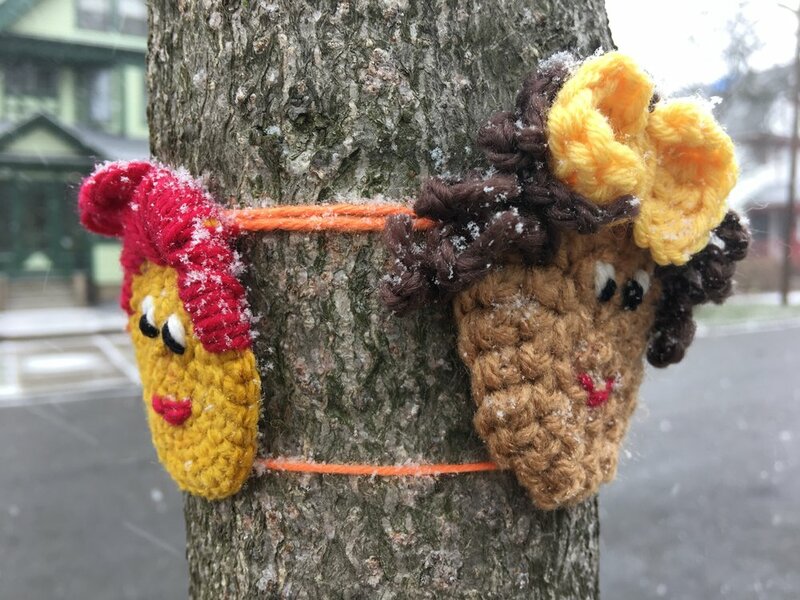 Photo by Hinda Mandell: The author's crochet faces outside the Susan B. Anthony Museum & House in Rochester, New York, during winter 2017. This proposed volume, an edited collection, is committed to investigating how people create handicrafts and share them publicly as a statement reacting to political policies. At the heart of this volume is an exploration of craft as action and a means of expression relating to unfolding current events throughout U.S. history. Craft activism “marries” a DIY, grassroots makers’ ethic with commemorative culture to reveal a unique relationship that is democratic, visual and rooted in the desire for social change. Contemporarily, crowd-sourcing on social media plays a significant role in these acts of craft + activism and its mechanisms will be explored in this book. This collection will feature essays that explore how craft has become a tool – a medium in both the artistic and communication sense – of the Resistance movement as a platform to express dissent and to build community among committed activists and those entering activist circles for the first time. This volume is also committed to exploring the role craft has played in other resistance movements and periods of unrest in the U.S. In this proposed volume, we can learn what happens when craft is transformed into an interpretive medium that breaks free from its practical and hobbyist formations. Instead, for those involved in “craftivism,” tools of the trade, including yarn, become a vehicle for making statements, crafting commentary and putting into conversation dialogues about gender, race, and its complicated march toward progress. After all, the definition of yarn – “interlocked fibers” – represents a keen metaphor as a medium that reflects our own social, human fabric. Chapters that make linkages between craft activism and social justice movements throughout history, and that explore issues of race and gender, will be especially welcome. This volume is also interested in ways that museums, history and arts organizations can leverage contemporary craft activism as a tool for community engagement. · Examples of Craftivist action in the U.S. connecting to themes of women’s rights, immigration, health care, disability rights, among others. Format: Potential chapters can include scholarly studies, first-person essays, magazine-style features and photo essays. The book’s editor welcomes contributions from academics, activists, essayists and those in engaged in craft-centric activism. Deadline: Please email Hinda Mandell (hbmgpt@rit.edu) by Nov. 30 expressing an interest in contributing a chapter. Submissions indicating interest past this date will be considered but early submissions of interest are most welcome. Submissions indicating interest should include a chapter title, a 200-word (approximately) chapter abstract and an author bio. Questions are welcome at any time and should be directed to Hinda Mandell. All scholarship and submissions should be previously unpublished and not under consideration elsewhere. Betsy Greer, Craftivism: The Art of Craft and Activism, Arsenal Pulp Press: Vancouver, 2014. “Yarn,” Wikipedia, accessed July 10, 2017, https://en.wikipedia.org/wiki/Yarn. Homepage, http://theyarnmission.com/, accessed October 3, 2017.